...offering you complete service integration. 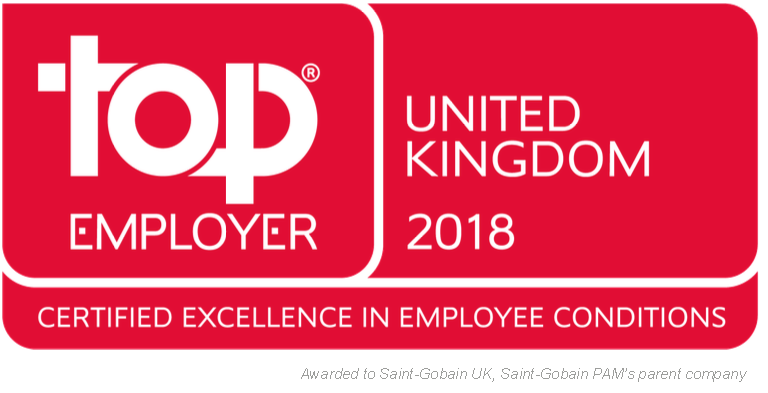 Saint-Gobain PAM is the UK arm of Saint-Gobain PAM, the international pipelines company, which employs around 9000 people in over 120 countries. Together they form part of the Saint-Gobain group, one of the world's leading multinational organisations. With the international support of parent company Saint-Gobain, we are able to offer unrivalled technical support, a total solution approach and unparalleled quality and innovation. A UK based business, with two foundries and a distribution centre in the Midlands, we combine international reach with local, specific solutions across all of our customers. We continually invest time, energy and expertise to create an extensive range of innovative solutions, which are easy to install, simple to joint and simply offer better value for money in terms of total life costs. All parts of our operation have audited quality management systems and fully satisfy ISO 9001:2008. All products are third party assessed and approved against all relevant world-wide regulations and standards. We are committed to sustainable and ethical development in all aspects of our business. Made from greater than 80% recycled material and 100% recyclable at the end of their long life, both ductile and cast iron provide a cost effective solution whilst protecting the environment. With Saint-Gobain PAM UK and the PAM brand, you can be assured of Quality, Innovation and Technical Expertise at all times. The worldwide "Top Employer" initiative is run by the Top Employers Institute. The certification is only awarded to organisations that meet top standards in human resources management, covering career development, primary and secondary benefits, working conditions, training and development and company culture.